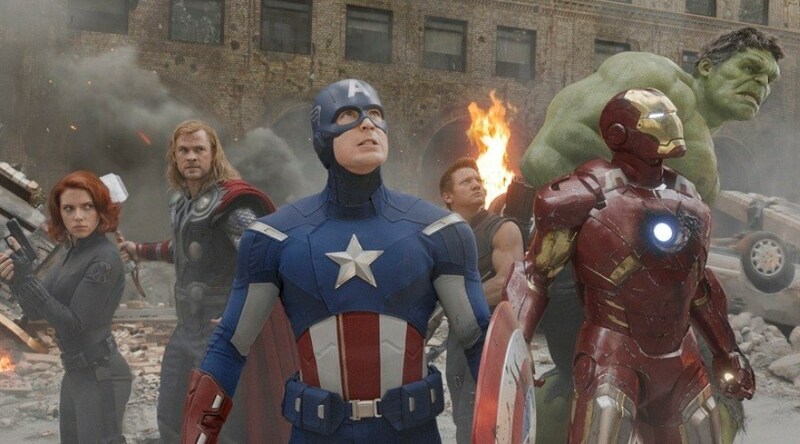 “Marvel's The Avengers” L to R: Black Widow (Scarlett Johansson), Thor (Chris Hemsworth), Captain America (Chris Evans), Hawkeye (Jeremy Renner), Iron Man (Robert Downey Jr.), and Hulk (Mark Ruffalo) Ph: Film Frame © 2011 MVLFFLLC. TM & © 2011 Marvel. All Rights Reserved. IN 1983 William Goldman, a screenwriter, coined the famous saying that in Hollywood, “Nobody knows anything” when it comes to predicting which films will succeed at the box office. To find out how true that remains, we have analysed the performance of more than 2,000 films with a budget of more than $10m, released in America and Canada since 1995, to see which factors help make a movie a hit. Crunching information from The Numbers, a website that collects data on film releases, and Rotten Tomatoes, an aggregator of critics’ and punters’ reviews, we found that the strongest predictor of absolute box-office receipts is a film’s budget. Even if it got no boost from its cast, from favourable reviews or other factors, a movie would generate an average of 80 cents at American and Canadian cinemas for every dollar a studio promises to spend on it. A film’s budget is announced while it is in production, to create a buzz and signal its quality—though in practice its true cost may vary from the announced figure. The more a studio commits to producing a film, the more it is likely to spend on advertising it. The budget also helps determine how widely a film is shown. Films with a budget of $10m-40m open, on average, in 1,600 of the 6,000-odd cinemas in America and Canada; those with budgets of over $100m open in 3,500. Sequels and franchise films are another way for studios to limit their risks. Nearly one in five of the films Hollywood pumps out nowadays is a sequel, up from one in 12 a couple of decades ago. All other things being equal, sequels earn $35m more than non-sequels at the box office. Franchise films increasingly depend on superhero characters. Hollywood made just eight superhero films between 1996 and 2000, but 19 in the past five years. A $200m-budget superhero film will earn $58m more at the box-office than a non-superhero film of the same budget. Superhero films (“Deadpool” excepted) tend to be child-friendly, for good reason: films that receive an “R” (restricted) certificate typically earn $16m less in cinemas. 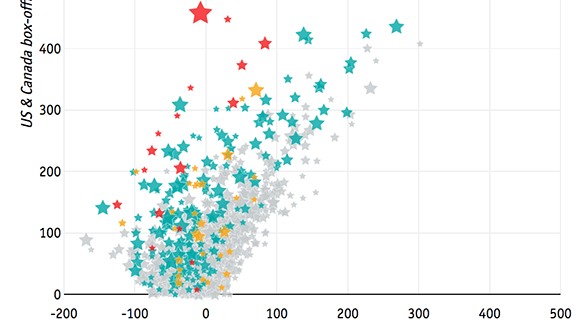 How a star’s previous films did helps a bit in predicting their next one’s success. Each $1 earned by a leading actor’s previous, non-sequel films in the past five years adds 2 cents to their current one’s takings. The very brightest stars, such as Jennifer Lawrence and Leonardo Di Caprio, whose films have earned more than $500m at the box office in recent years, would add around $10m to ticket sales for a film. Do critics play a role in the success of films? Not as much as they would like to think. Between 1996 and 2006 an extra ten percentage points on the aggregate critics’ score on Rotten Tomatoes was associated with just $4m in extra box-office takings. Now it is worth just $1m. The wisdom of crowds matters more these days: the same increase in positive audience reviews on Rotten Tomatoes is associated with an $11.5m increase in box-office revenues. 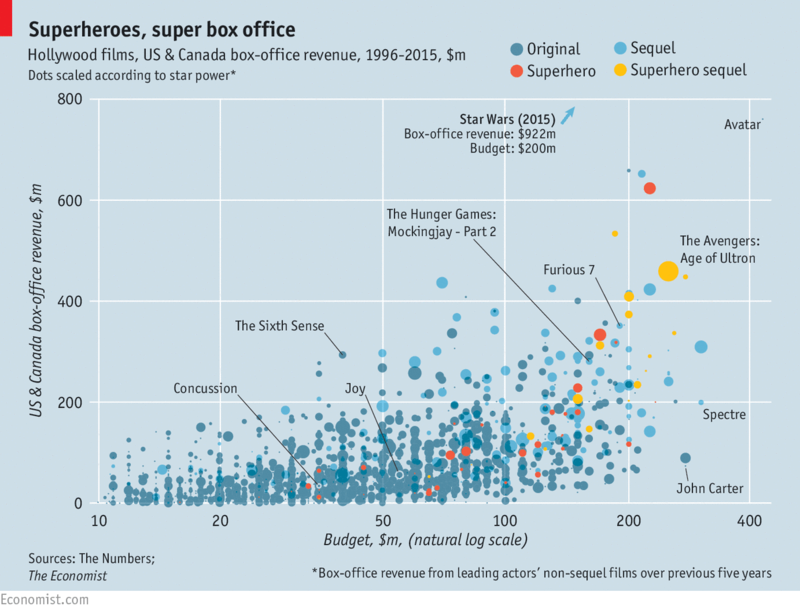 Taken together, these factors explain about 60% of the variation in box-office revenues. Adding an estimate of marketing costs increases our model’s accuracy by another 20 percentage points. That leaves about one-fifth down to factors not explained by the model. “John Carter”, a $275m science-fiction extravaganza that was one of the biggest turkeys in Hollywood history, should have earned $235m according to our model. It made just $73m when it was released in 2012. Clearly, no one yet knows everything. However, our analysis suggests a formula that maximises the chances of packing them in. First, create a child-friendly superhero film with plenty of action and scope for turning it into a franchise. Set your budget at an impressive but not reckless $85m. Convince a major studio to distribute it on wide release in the summer (when releases earn an average of $15m more than at other times). Lastly, cast two lead actors with a solid but unspectacular box-office history, who are thus not too expensive. With reasonable reviews from critics and the audience alike, your film would make about $125m at the American box office. But do it for the money, not the plaudits: such a film would have just a one-in-500 chance of carrying off an Oscar for Best Picture.